Yesterday was a typical Monday for our household. In addition to work/school, our oldest daughter had skating practice and her younger sister had dance class and, since that pretty much meant my wife and I would have a very limited amount of time to make dinner, I decided to make something in the slow cooker. I wasn't completely sure what I wanted to make so I ended up stopping at the store yesterday morning in search of something. 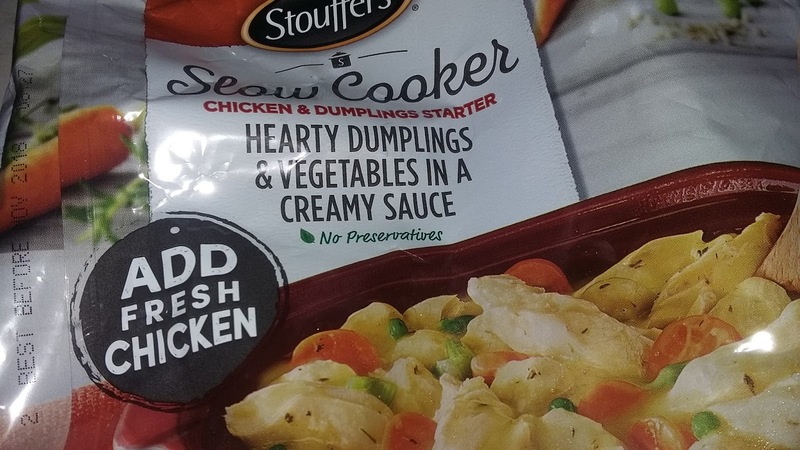 While there, I had remembered seeing the Stouffer's slow cooker starter kits in the freezer section and, after some consideration, purchased this one for $5.99. I wasn't really sure what to expect from this product, mostly because I have had mixed results with similar products. But, after trying it last night, I did feel as though it was an OK purchase. One of my biggest considerations when making a purchase like this is convenience. I usually start our slow cooker dinners when I'm home for lunch and (at least if I want to actually eat lunch) I have a limited amount of time to the prep work. In this particular case, I really couldn't have asked for much easier. All I had to do was pour the contents of the bag into the slow cooker and add fresh chicken and water. Even with slicing the chicken in strips, this didn't take more than a few minutes and the dinner was fully cooked by the time we were able to sit down and eat. I was actually a bit surprised by the quantity inside the bag too. When I made this purchase, it really didn't look like it would be enough. But, after the chicken was added and it was given a chance to cook, there turned out to be quite a bit. We even had enough leftover for another couple servings. This did make the $5.99 price tag acceptable. There was, admittedly, something a little "off" about the seasonings in the broth, though my wife and I couldn't reach an agreement about what was missing. That being said, the overall flavor wasn't terrible. It was obviously a pre-packaged soup rather than something that was made from scratch. But, I've definitely had much worse for more money. In fact, I found I kind of liked the dumplings that were in this soup. They were a bit on the small side. But, they still managed to be much more enjoyable than I was expecting from a frozen dinner and I ultimately helped myself to three servings of it as a result. Because of this, I do think this purchase was one that was worth my money. It wasn't perfect. However, the taste, quantity and convenience were good enough for me to purchase this product again. Is there anyway took cook this conventionallly and in much less time?